Cant decide on the perfect gift? You don't have to! 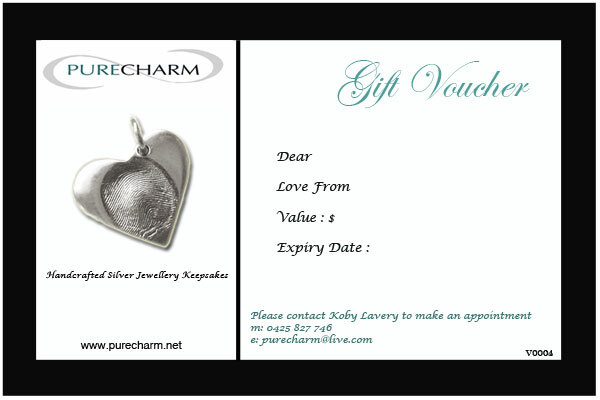 At Pure Charm Jewellery I offer gift vouchers for all price ranges. These vouchers are the perfect idea for a baby shower, new mum, or just for that difficult to buy for friend or relative. Gift vouchers can be gift wrapped or just sent in an envelope. They are beautifully presented on magnetic paper, so they can be conveniently kept on the fridge and will never be lost or forgotten. To order a gift voucher, simply choose the amount and write who the voucher is to and from. If you have any futher requests please email me.